One morning, I woke up in pain. Excruciating shocks of pain attacked my shoulder and radiated down my arm and hand in bizarre fluttering waves. 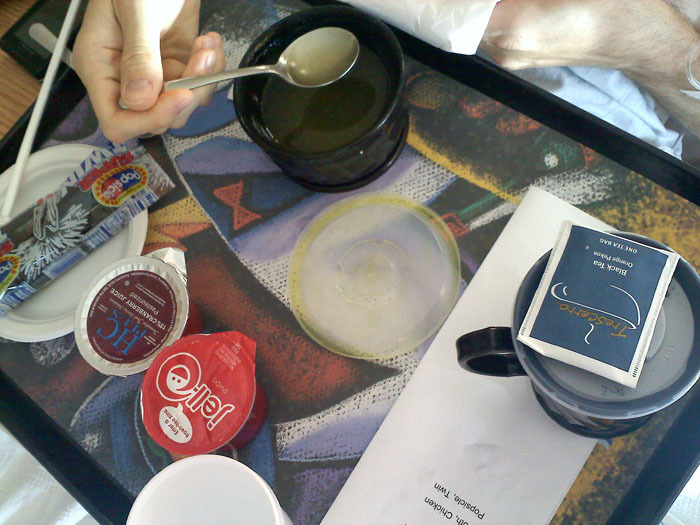 Then my hand became numb, and I lost all the strength in my arm — I couldn’t even lift a coffee cup. But the pain. Wow. Those who have met me know how rugged and stoic I am. How I have such a high tolerance for pain and discomfort that people sometimes wonder if I’m a viking. At any rate, ever try to get medical care on a holiday weekend? Good luck. I was prescribed Percocet, Valium, prednisolone, Flexeril. 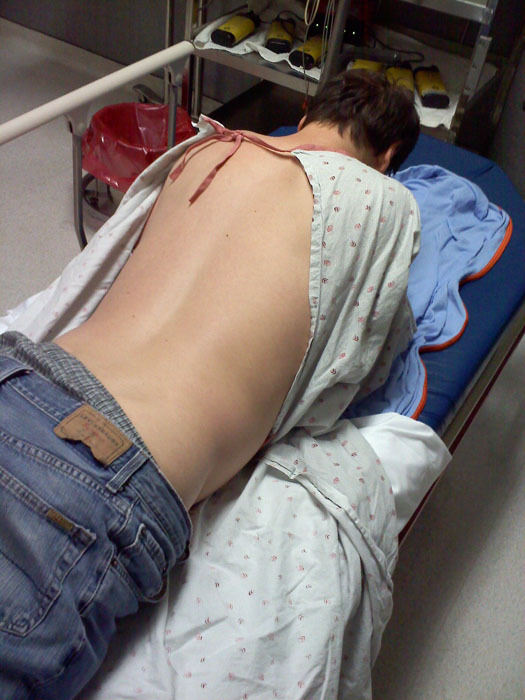 I had two dilaudid shots and eventually had surgery to remove a herniated disc at C6-C7. The first people I visited were at ExpressCare Plus. Most urgent care places, in my experience, are crummy. You take what you can get because they’re available and convenient. ExpressCare Plus, though, is excellent. Very clean and never crowded. At least not when I was there. 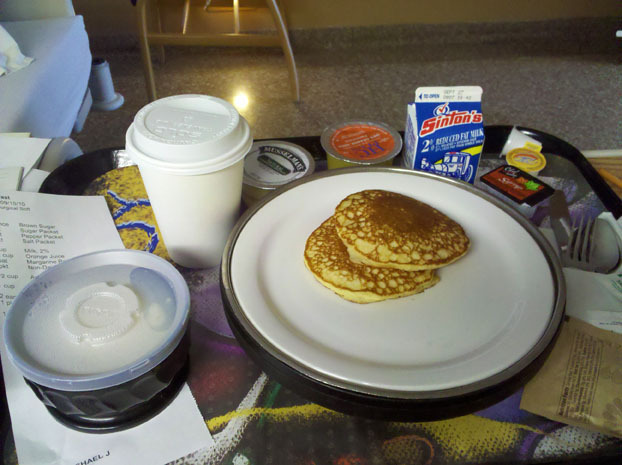 The physicians and staff were all very pleasant and professional. Under the circumstances, though, there just wasn’t anything they could do for me except prescribe medication. ERs are never fun, but with a little sense of humor and some prescription medication, the hours-long wait for treatment can be bearable. Whoa, Penrose ER, are you coming on to me? Seriously? I am not in the mood, Penrose ER. I am not feeling well. I don’t doubt that the ER doctor is an outstanding physician. And ERs are terribly busy and crazy. Fair enough. But Dr. Maul (we called him Darth Maul, but not to his face. I’m sure it’s a completely original joke that he’s never heard before.) didn’t have a great bedside manner. He was curt and seemed to not listen. But like I said, he’s got a tough job, and here comes some doofus with a sore shoulder. Boo hoo, doofus. Walk it off. Seriously, though, the doctor wanted to get an MRI done, and I wanted to know how much it would cost. Nobody could tell me. Sorry, but I am not going to get an ER procedure without knowing how much I’m in for and what my alternatives are. Best health care system in the world? Sure didn’t feel like it. Hi, there, I'm Dr. Darth Maul. What seems to be the problem today? You say your shoulder and arm hurt? Hop up on the table here and let's have a look. I’ve been fortunate to have a lot of experience with neurosurgeons. 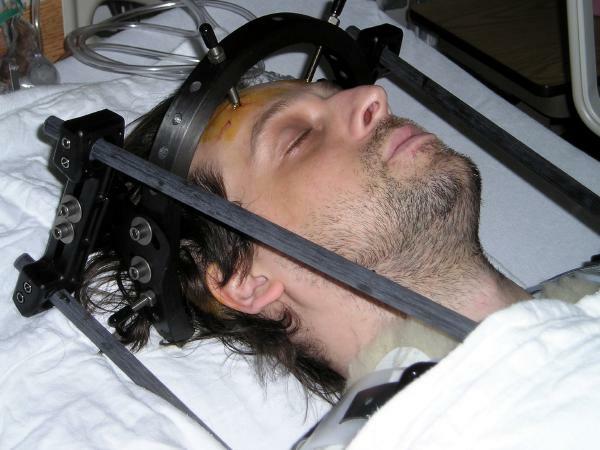 I wore this halo thing bolted to my head for four months after a car crash in 2004 in which I broke C1-C2. Here’s a joke: What’s the difference between God and a neurosurgeon? … God doesn’t think he’s a neurosurgeon. HAHAHA! Comedy gold, people. Comedy gold. 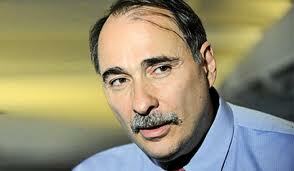 David Axelrod is not a neurosurgeon. But you know what, I bet he could be if he wanted to. He is that badass. Turns out the trouble with my shoulder, arm and hand was a herniated disc at C6-C7. 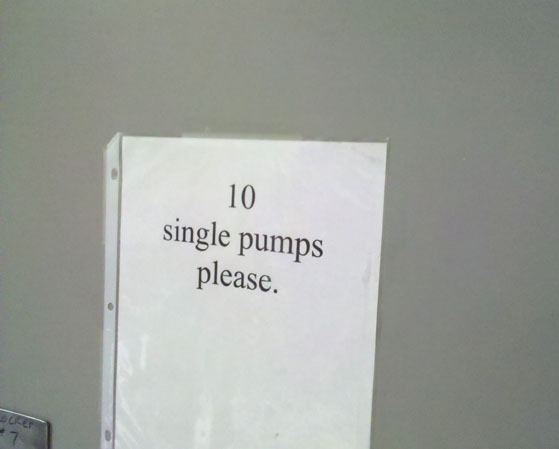 And I happen to be part of the 10 percent that need surgery. Lucky! I got a second opinion from a Dr. Joseph Illig, who was very straightforward and brusque. 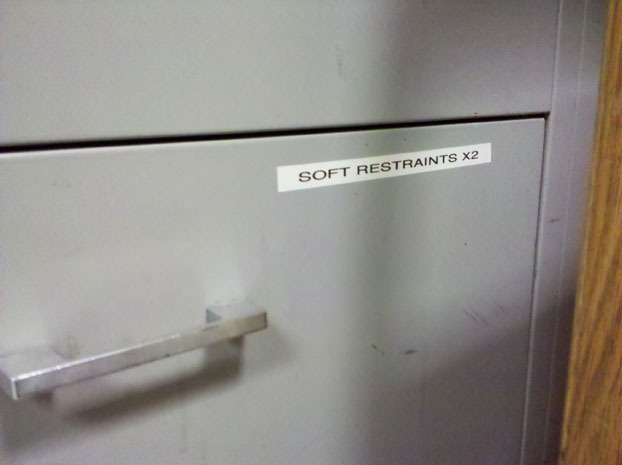 But not in an off-putting way. He was also outstanding. If you ever meet him, do not call this surgery “routine.” Fair warning. OK. So surgery it is, then. Then I was in another room with a neck brace on, and it was hard to swallow. While I was out, they cut through my throat, moved my vocal cords and jugular out of the way, removed the bulging disc, replaced the disc with cadaver bone, then screwed a titanium plate onto my spine to stabilize C6 and C7. Seriously. Cadaver bone and titanium. I will probably be bionic after this surgery. It’s about time. I’ve been wanting to be bionic now for a while. 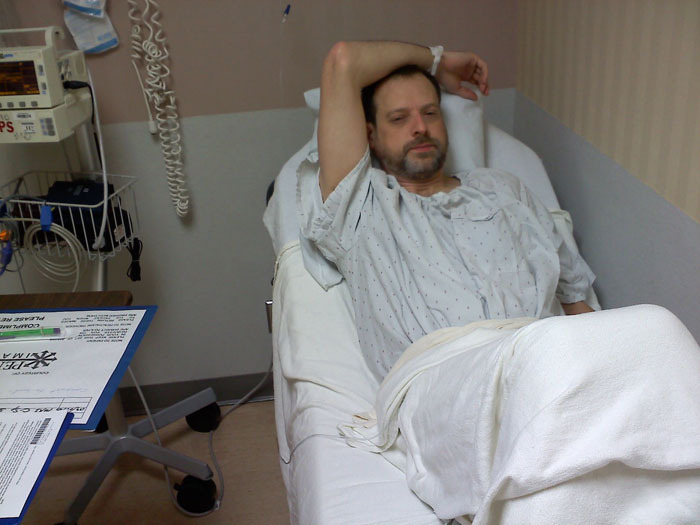 After the surgery, I stayed overnight in the hospital watching TV and being uncomfortable. There was very little pain and all my limbs worked. Success! It was difficult to sleep, so the girlfriend brought me some podcasts to listen to. 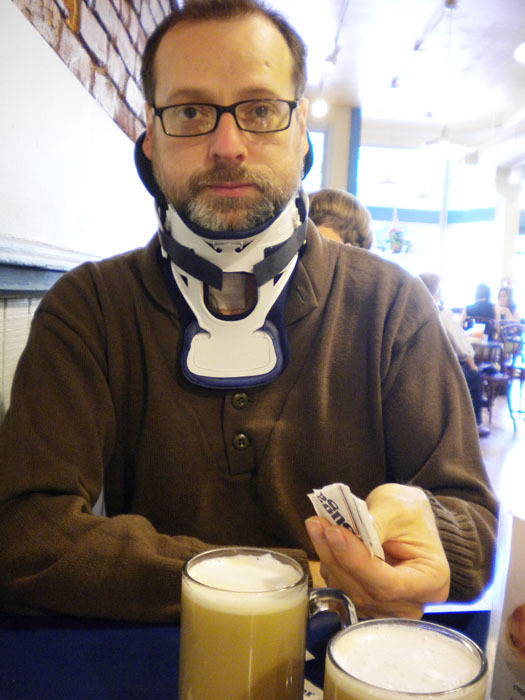 For a few weeks, I had to wear the Miami-J neck collar to keep everything from moving around. 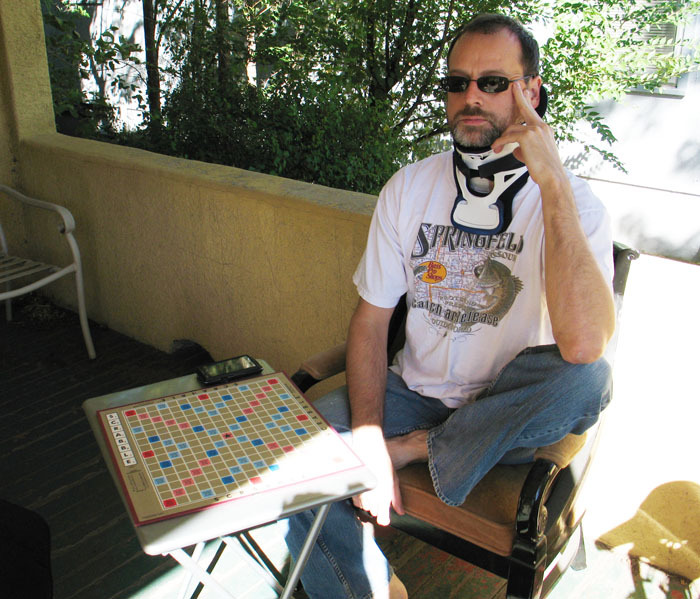 The Miami-J is, of all the neck braces I’ve worn, the most comfortable. Yes, it gets irritating, and it’s hard to sleep in, but there are worse things. A suggestion for the Miami-J makers: Customization. The Miami-J comes in blue and white. That’s it. Why not have red pads? How about some cool decals for the chest plate? How about a Miami-J with spikes on it? 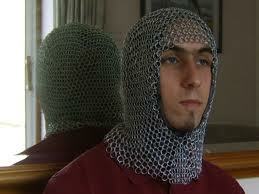 Or a chainmail neck curtain. How about something like what this guy's wearing for the Miami-J? It wouldn't need to cover the entire head of course. I'm just brainstorming. It’s been a little over a month now, and it looks like I’ve recovered. 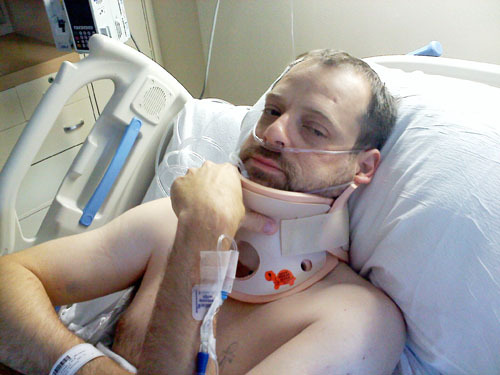 Neck’s still a little stiff, and my range of motion’s not what it was. And I have to do some work to get the strength back in my arm. But overall, things are looking good. 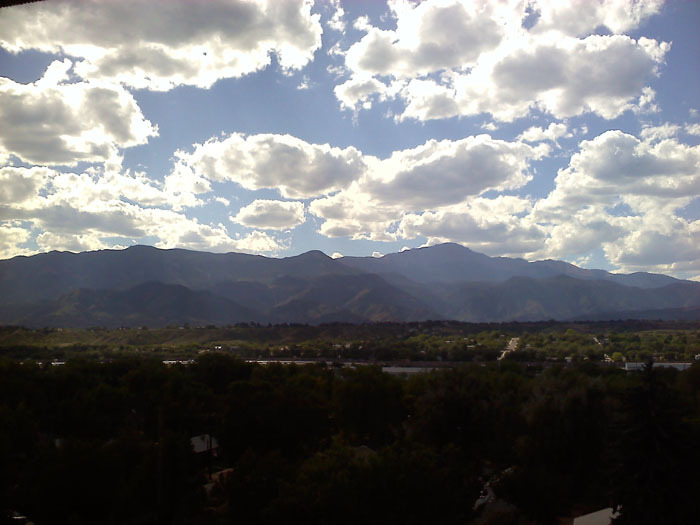 Everyone kept telling me about the fantastic views from my hospital room. Except I couldn't turn my head to see it. I guess this is what they were talking about. Perfecting my Pitiful Look. Almost there! Despite how fun I look, I apparently wasn't a lot of fun to be around. 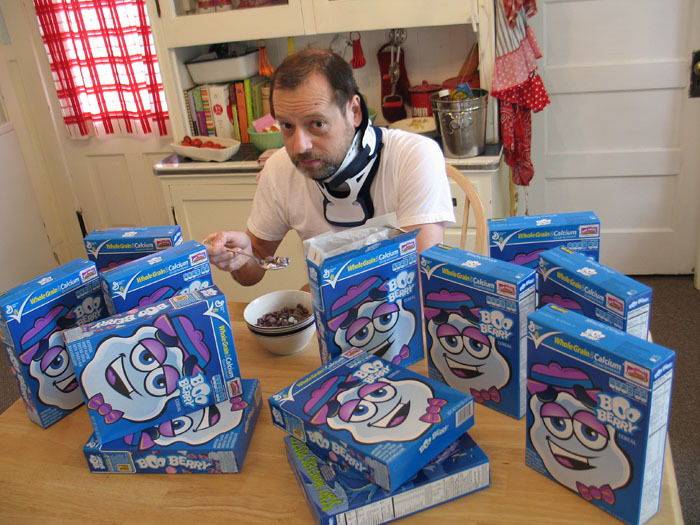 Best Internet friends Shelby and Sandy sent a case of get-well Boo Berry cereal. A picture? Oh, yes please! Let me fix my hair. By the way, notice the turtle sticker on the neck brace -- to let you know which side's the front. Clever.